UPDATE: Enjoy this project from our former home. We’re giving our current home a total remodel. Click HERE to take a look. 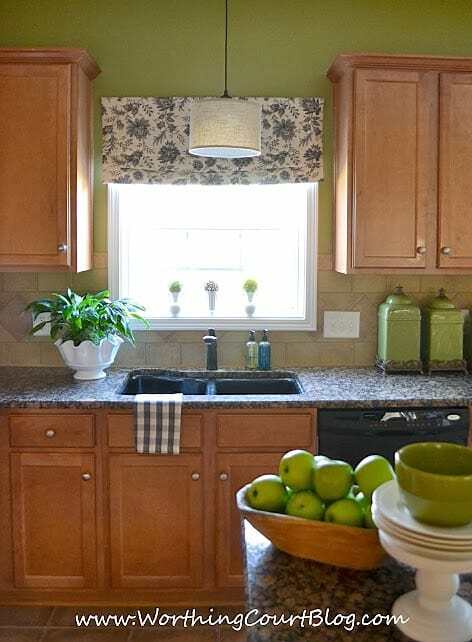 There’s one item in my kitchen that has always bugged me, but I came up with an easy solution to disguise it. 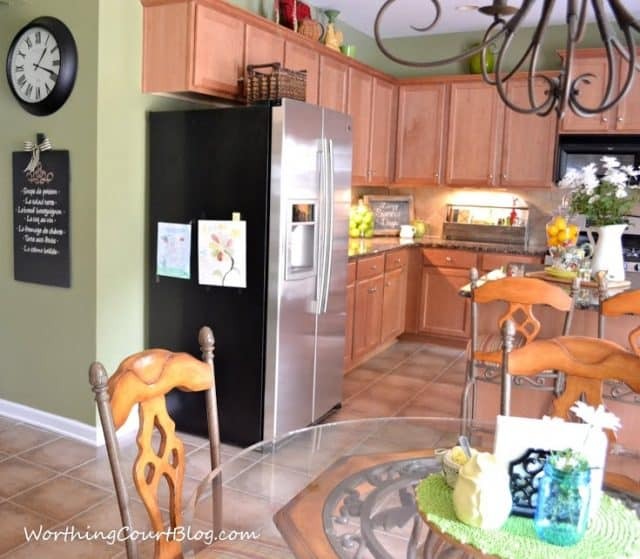 I gave a lot of thought to having someone add a stained-to-match piece of wood beside the fridge that would extend from the top of the cabinet down to the floor, but I didn’t think that was a good option in my case. 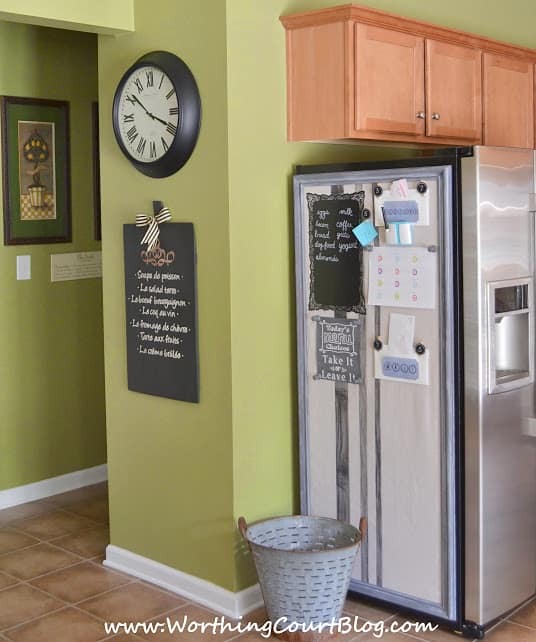 I’ve always wanted a bulletin board in my kitchen, but I don’t have much wall space to hang one on. So the side of my fridge seemed like the perfect spot for one. And it could pull double duty by minimizing the black hole side of my refrigerator while also serving as a command center of sorts. I intended to purchase some wood trim from a big box store to build a frame with, but then I stumbled across a huge frame on the clearance aisle at Hobby Lobby that was marked down to $22 from $240. I couldn’t believe it! 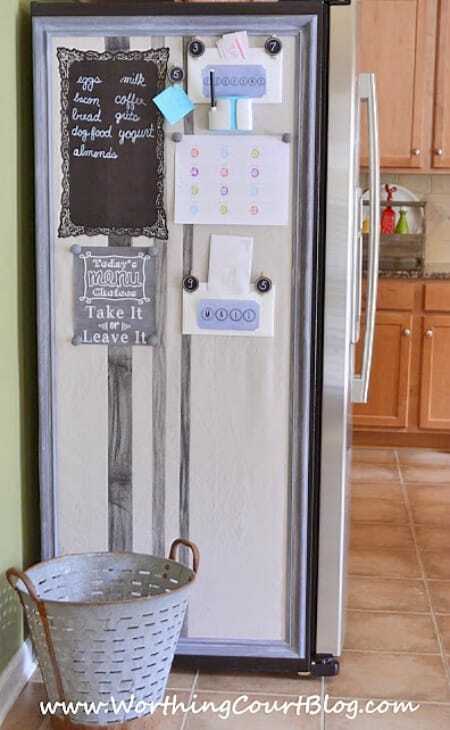 The frame measures 60″ x 24″ and was the perfect size to cover most of the side of my refrigerator. The frame was a yucky color, but a little gray and white craft paint took care of that! 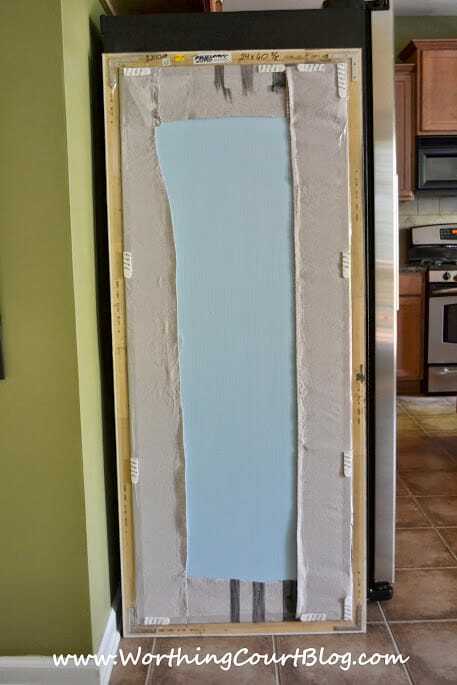 I purchased a large sheet of exterior insulation from a home improvement store and cut it to fit inside of the frame. I wanted my bulletin board to mimic the look of a grainsack, so the next step was to tape off and then paint some stripes onto a piece of dropcloth. 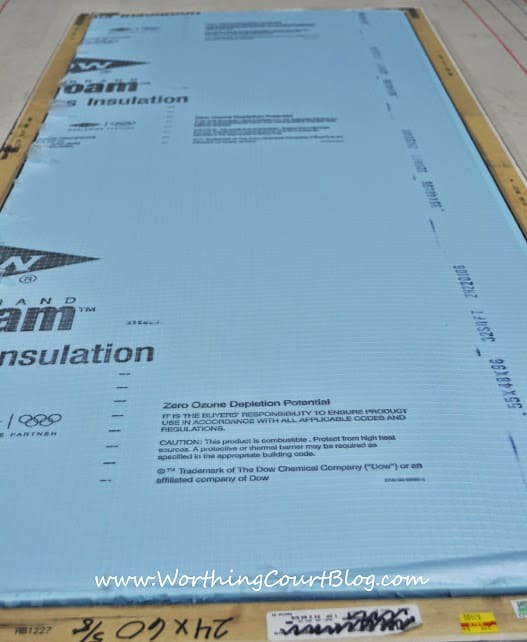 The dropcloth was cut large enough to completely cover the insulation with several extra inches to wrap around to the back. I just used plain old black craft paint to paint the stripes and then sanded them for a worn look. 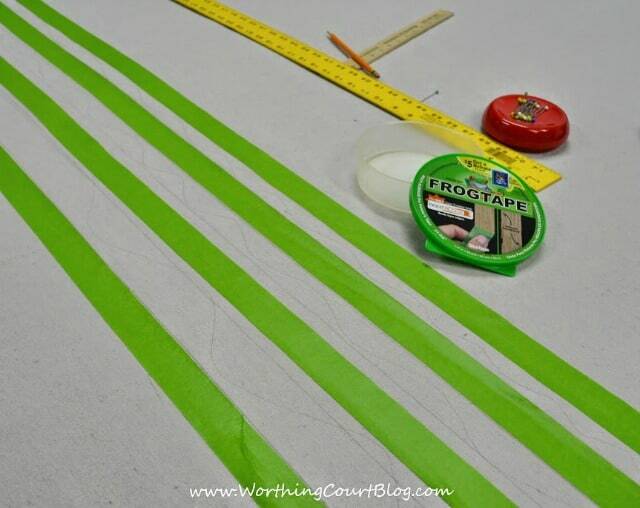 If you do this, make sure the paint is completely dry before sanding and don’t remove the tape until you’re finished. Once those steps were completed, I simply positioned the dropcloth where I wanted the stripes to fall within the frame, wrapped it around the back of the foam insulation and hot glued it into place. I needed to secure the covered piece of insulation to the frame, but it’s so lightweight that some super sticky packing tape did the trick. Here’s what the completed bulletin board looks like from the back side. I’ve outfitted the frame with multiple Command Velcro Strips to adhere the bulletin board to the side of the fridge without damaging it. Now for the fun part – accessorizing the bulletin board! 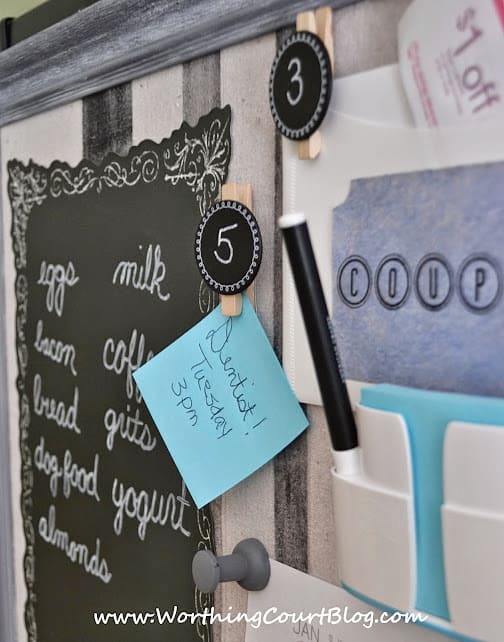 I found a stick-on chalkboard at Target, which is great for jotting down groceries that I need to add to my list. Some pre-made plastic envelopes are perfect for holding coupons and mail. 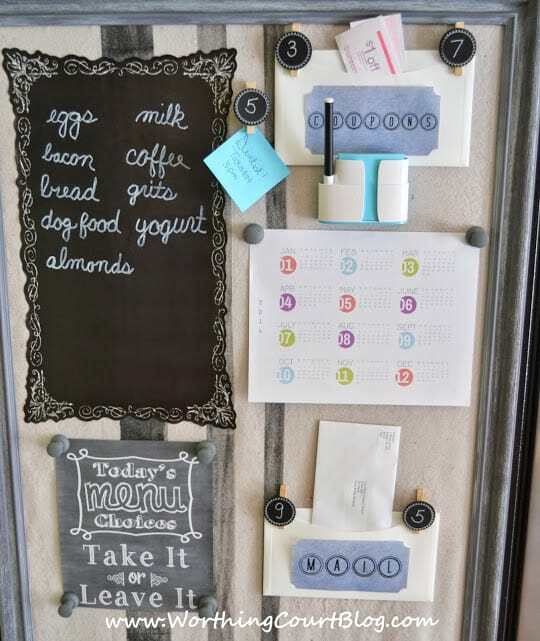 Cute little clothespins with a round chalkboard face (from Target) work great for holding the envelopes and special reminder notes in place. I just glued a thumbtack on the back and now they’re perfect for the bulletin board. Oh – you might think this would be a logical place for a weekly menu, but if you look closely you’ll see what I have to say about that! Click HERE if you’d like to print one for yourself. A year-at-a-glance calendar works best for me. I’m not good about keeping up with a daily calendar (I use a Google calendar on my pc), but I do need to know what the actual date is every now and then. Click HERE for several options for year-at-a-glance calendar options. 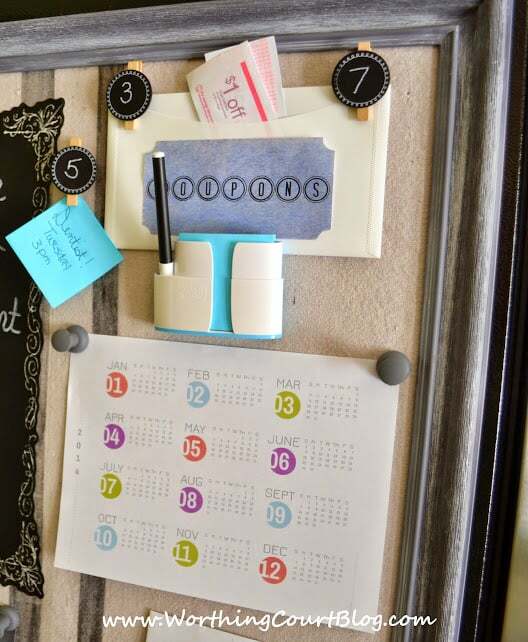 The calendar and “menu” are attached with ginormous tack pins that I found at Dollar Tree and spray painted gray. A little cup that holds note paper sticks to the dropcloth surface just fine with Command Strips. The brightly colored papers work well to grab my attention when there’s something that I don’t want to forget. I’m loving not having to see the big ole black side of my fridge and the bulletin board is already coming in handy! Now all I need is some artwork from the grands to display on it. 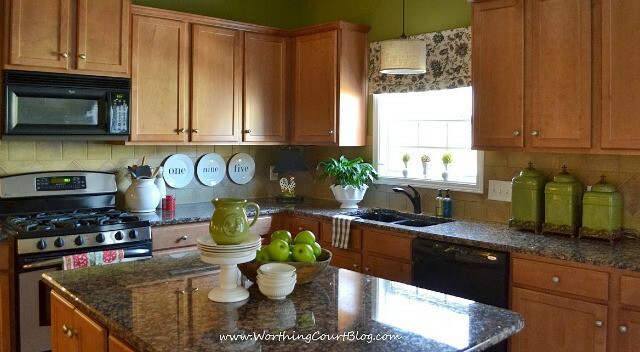 Want to see other farmhouse touches that I’ve added to my kitchen? Thank you, Stacey. I’m so glad that I finally figured out a way to hide the side of my fridge! OMGee this is genius. You totally scored with that frame and I love what you did with it. Pinned. Would love if you shared this on the Merry Monday Linky Party. Thank you, Erlene. I admit that I was pretty pumped when I found the frame for such a good price! Thank you, Christine and thanks for the pin too! I am in love with this idea! It looks great, thanks for sharing at Inspiration Monday! Thank you, Jane. I don’t understand why in the world refrigerator manufacturer’s put black sides on stainless steel refrigerators! What a fantastic idea! I have a very similar black hole i my kitchen. thanks for the inspiration! Love the message center. Love the green paint. What ìs the name of the color. Thanks. I found it… Sherwin Williams Lemon Verbena.